When it comes to food, Dubai means different people and different tastes. Dubai is a full-fledged food arena where hundreds of flavors from different countries, cultures and nations congregate beautifully. Like Chinese, Japanese, French, Italian, Asian and other European flavors, Dubai also embraces the German cuisines harmoniously. There are numerous German restaurants in Dubai that offers a remarkable array of authentic German flavors to the food lovers of Dubai. If you are from Western Europe and craving for German food while missing your home town, then Dubai has an inclusive range of German restaurants that are all set to please you with their vigorous, well-cooked and well-served German cuisines. Ranging from traditional bistros that serves authentic German recipes, to modern fusion restaurants, that delivers contemporary German food, Dubai has everything to gratify your dribbling taste buds and to delight you. Here stated are the five best German restaurants in Dubai, that offer you the best food quality at reasonable price. Established in 1977, Der Keller is one of the finest German restaurants in Dubai that offer authentic German cuisines prepared from super fresh ingredients. The chefs at Der Keller are the best in their culinary skills and serves you the optimum. This German bistro in Dubai offers you a great miscellany of all those German flavors that you once wonder to try out. Served in a lively and casual dining ambiance, Der Keller is perfect for a casual meal with friends and family. The place averagely cost you around AED 350. This German restaurant is located on the level 1 of Jumeirah Beach Hotel – Umm Suqeim, Jumierah Beach Road Dubai. Hofbräuhaus is hearty Bavarian for enjoying the authentic German cuisines in Dubai prepared by some of the most professional culinary artists. If you want to enjoy the authentic German flavors in a formal alluring atmosphere, then nothing could replace Hofbräuhaus. The soft enchanting ambiance of the place and the typical old style bistro appearances of the place make it exceptional. More amazingly, on Thursdays and Fridays, you can revel into a wonderful German buffet in Dubai, which offers a better food range for only AED 275 with complimentary lip-smacking desert la carte and a quenching soft beverage from the counter. Hofbräuhaus is situated on the restaurant level of JW Marriott, Abu Baker Al Siddique Road – Dubai. Brauhaus is another brilliant option to embark upon for having German cuisines in Dubai. The place is perfect for enjoying an extensive range of traditional German dishes in a casual yet stylish and glitzy dining setting. 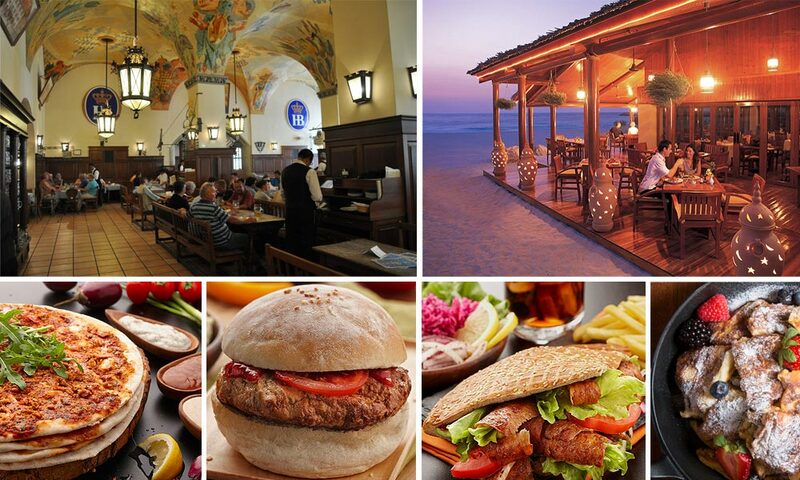 Brauhaus offers a great range of traditional and contemporary German food, deserts and beverages in Dubai. The ambiance is lively, refreshing and pleasing and offers you to make your day bigger with a perfect German meal in a seamless feasting vibe. Brauhaus is located on the 2nd of December Street – Dubai. Doner Kebab is one of the most famous German food brand and it also upholds the highest number of outlets in Dubai. So whenever you want to try German flavors, Doner Kebab will be the first that you will find near you. This bistro is perfect to enjoy a brunch or a late night eat with live music and a fantastic lounge bar. Price at Doner Kebab starts from AED 35. Doner Kebab is located in, Jumeirah Lake Towers, Media City, Business Bay, Mirdif, Al Barsha, TECOM, Dubai Marina, Silicon Oasis and City Tower. Wienerwald is a contemporary German restaurant in Dubai that offers a brilliant choice for German fast food. Wienerwald offers a great variety of wraps, schnitzels, burgers, fillets, rolls, etc. the primary specialty of Wienerwald is chicken and all its menu is chicken centered. So if you are a chicken lover than Wienerwald is a perfect place to be. This place is all set to offer you a casual and easy dining with quick service, healthy eating and great flavor. The place averagely cost you around AED 120 for starter, main course and a beverage. Wienerwald is situated inside The Walk, Jumeirah Beach Residence Dubai. These are some of the best German restaurants in Dubai that offer delicious German food. If you want to recommend a German restaurant in Dubai, please do so by adding comments below.